This is intended for use in my "grunnkurs" class of the upper secondary school in Norway . I will try to list, and explain, some of the problems/terms met with when we read texts about Northern Ireland. I am presenting an outsider's view, based on what I have read and heard. Opinions differ as to causes and effects in this conflict and it is important that you consult other sources as well - with a critical but open mind. 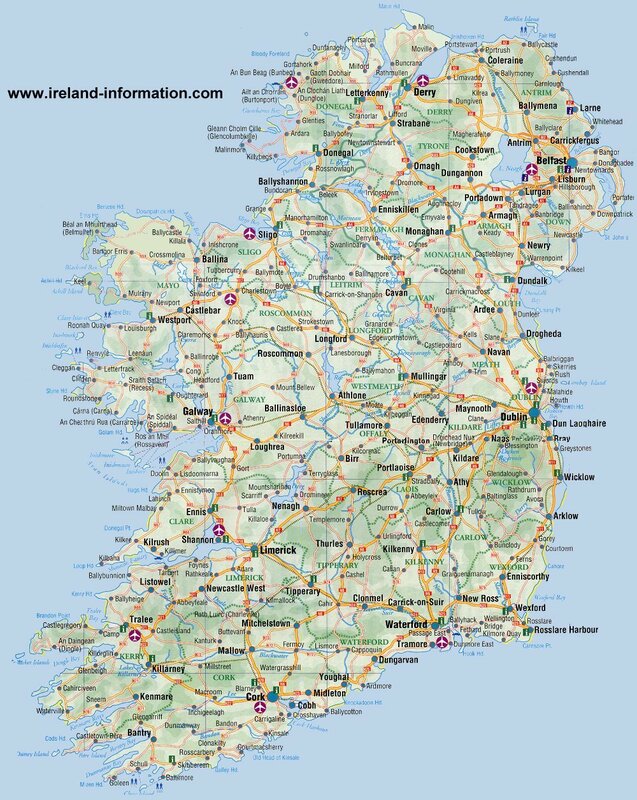 To see a big map of Ireland click here. a service where you may download free maps of Ireland. To find a place, use Expediamaps . Some dates in Irish history. Various Palaeolithic tribes (users of flint) probably first inhabited Ireland a few thousand years BC. Ireland is mentioned under the name of Ierne in a Greek poem of the 5th century BC. introduced a new culture (language, customs, and religion) into Ireland. The Apostle of Ireland (also called the patron saint of Ireland) spent much of his life converting the Irish to Christianity but it took some time after his death (about 461) before the new faith was fully established in the island. The Irish celebrate their most important national holiday "St Patrick's Day" on the 17 of March. (- a map showing Viking settlements and plundered and surviving monasteries will be shown if you click on the icon to the right). English knights took control of an area around Dublin. The English began a policy of immigration when two Irish earls fled from Ulster because they feared the English would arrest them for treason. Most of the land of their tribes was given to Scottish and English settlers. The English continued a policy of confiscating land from the Irish nobility e.g. on the rich soil in Ulster (Northern Ireland) and Munster (The South of Ireland). Much of this land was given to English Lords and ex-soldiers. The Dublin Parliament was abolished – Union between England and Ireland established. The English government reacted insufficiently and too slowly to help. English landowners at the same time exported grain from Ireland. The Easter Rising in Dublin. After a war of Independence The Irish Free State was established - but they had to stay in the Commonwealth and Northern Ireland (Ulster) remained part of the UK. Police attack Civil Rights demonstrators i Londonderry. This marks the post war start of the unrest in N. Ireland. Today a loose association of countries - mostly former British colonies (Previously: The British Commonwealth / The British Empire). Consists of 51 sovereign nations and several dependencies. Great Britain, Antigua and Barbuda, Australia, the Bahamas, Bangladesh, Barbados, Belize, Botswana, Brunei, Canada, Cyprus, Dominica, The Gambia, Ghana, Grenada, Guyana, India, Jamaica, Kenya, Kiribati, Lesotho, Malawi, Malaysia, Maldives, Malta, Mauritius, Namibia, Nauru, New Zealand, Nigeria, Pakistan, Papua New Guinea, St Kitts and Nevis, St Lucia, St Vincent and the Grenadines, the Seychelles, Sierra Leone, Singapore, the Solomon Islands, South Africa, Sri Lanka, Swaziland, Tanzania, Tonga, Trinidad and Tobago, Tuvalu, Uganda, Vanuatu, Western Samoa, Zambia, and Zimbabwe. The Union (now Republic) of South Africa withdrew from the Commonwealth in 1961, but rejoined in 1994. Pakistan left the Commonwealth in 1972, but became a member again in 1989. The Republic of Ireland is associated with it for commercial purposes but is not a member. This battle was fought near the Boyne river about 50 km north of Dublin on July 1st 1690. The former King James II of England who was trying to win back the English throne had joined forces with the Irish - they had about 21,000 men. The new English King William III of Orange with about 35,000 men. The army of William III of Orange (the Protestants) won. The N.I. Protestants celebrate the victory every year (on the 12 of July though). The Protestant organisation: The Orange Order (established in 1795), was named after William III of Orange.